Plug in a 3/4G USB dongle to create your own Wi-Fi hotspot. TL-MR3020 is field-tested to be compatible with 120+ LTE/HSPA+/HSPA/UMTS/EVDO 3G/4G USB modems, ensuring fast and stable internet connections wherever you are. A minuscule bank card-size design fits in your pocket deliver high-speed internet access during family vacations, long road trips, or when traveling for work. Just take it and enjoy your journey! 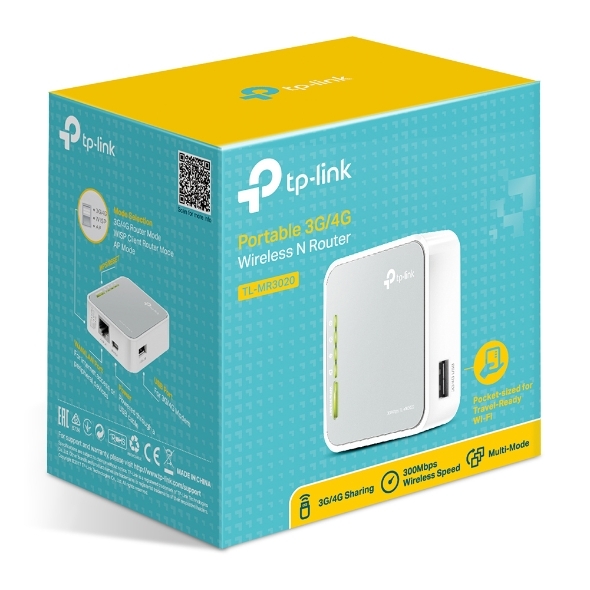 Connect to the Ethernet to instantly create a private wireless network and share internet access to all your Wi-Fi devices. Transform your existing wired network to a wireless one. Extend your exiting wireless network for larger wireless coverage or more stable connection via an Ethernet cable. TL-MR3020 delivers speeds of up to 300Mbps, meeting high-demand networking needs such as HD streaming, online gaming, and downloading large files. 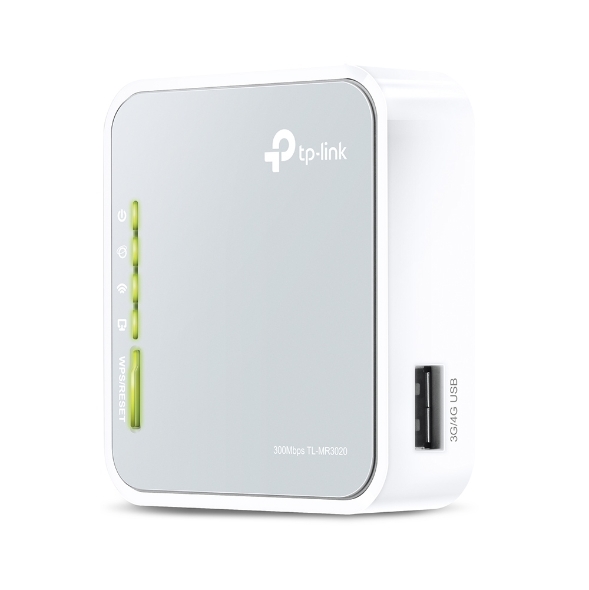 This super-compact device delivers reliable Wi-Fi connections for up to 32 wireless devices-like tablets, laptops, and phones- simultaneously, perfectly meeting needs of internet sharing in a business conference or parties at home. A built-in micro USB port makes it easy to plug into your laptop, smartphone charger, power adapter, or power bank to charge your router. *Maximum wireless signal rates are the physical rates derived from IEEE Standard 802.11 specifications. Actual wireless data throughput and wireless coverage, and quantity of connected devices are not guaranteed and will vary as a result of network conditions, client limitations, and environmental factors, including building materials, obstacles, volume and density of traffic, and client location. 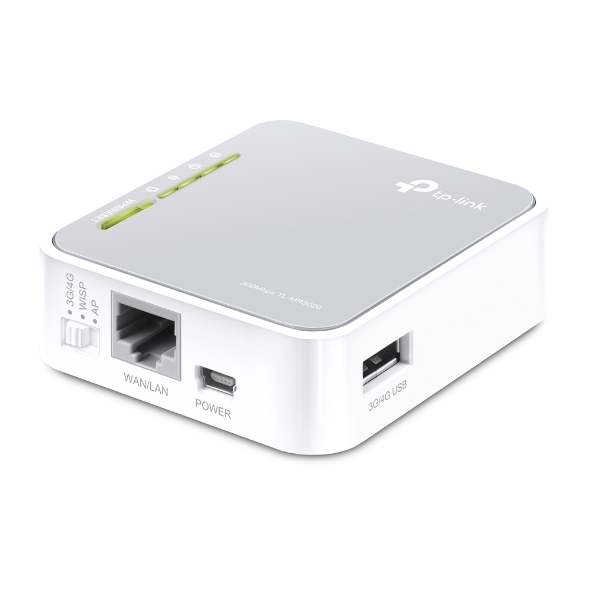 1 10/100Mbps WAN/LAN Port, USB 2.0 Port for 3G/4G modem, a mini USB Port for power supply. Microsoft® Windows® 98SE, NT, 2000, XP, Vista™ or Windows 7, 10, MAC® OS, NetWare®, UNIX® or Linux. TL-MR3020 receives 9 stars out of 10 from Komputer for Alle Magazine in Denmark. TL-MR3020 gained “Best Value” award from magazine PC Market in HongKong.